Happy New Year and welcome to year eight of our homestead journey. On April 30, 2009 we signed on the dotted line and have been planning and building our homestead ever since. That's when we started working on a master plan and prioritizing our list of goals. We've made changes along the way, accomplished a lot, often felt overwhelmed, and, for the first time, actually feel like we're beginning to see the light at the end of the tunnel. 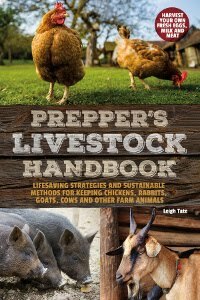 While we are still very project oriented, I am beginning to see a shift toward a more seasonal routine: garden, kidding, pastures, haying, harvest, food preservation, firewood, maintenance and repair; all of the things that are somewhat predictable because they happen at roughly the same times every year. The purpose of the master plan and all the projects, was to get us to that point - a life in rhythm with our seasonal routines. That doesn't mean there won't be projects, but the projects will shift in purpose. They will be less for establishing (which is what 5 Acres & A Dream The Book was all about) and more toward fine tuning. Only three, but they all seem huge. We'll still have interior work to do and would also like to add on a greenhouse, but the first three will be the focus this winter, especially since work on the porch ceiling and windows can be done somewhat under cover. Actual progress will depend on time, money, and what we find when we tear into the walls. If there is extensive structural damage that needs repair, well, the project takes a lot longer. The barn will be a summer project. Dan wants warmer weather to work on the foundation, and the rest is "we'll see." We've revised our barn plan and have all the lumber, so that's a lot done already. I'll have a post about our updated plans for the barn soon. Of the fencing project, I'll continue finding and clearing the old fenceline for now. It's easier to do when all the leaves are off the trees, so perhaps the actual fence installation can commence next October or November. This project is actually dual purpose. The pine trees that need to be cleared will be candidates for Dan's sawmill and our upcoming supply of lumber. So that's it for goals. We have a few finishing up things like the rain tank and a second coat of paint for the Little Barn, but everything else now falls under fine tuning and seasonal routine. I'm not sure how far we'll get this year, but seeing some long-term projects finally nearing completion is highly motivating. How about you? Any specific things you hope to accomplish in the upcoming year? Are you making plans? Or are you just going to enjoy the year as it comes? Dawn, that is very exciting indeed! I love that your goals are written down. I am trying to focus still on healing. My goals are shifting toward the seasonal, as well. Lighting my duck house to get eggs out of those NOISY GIRLS. I'm going to have to sit in this quiet morning and think. I am delighted to be here to think about it! Best wishes for a happy , healthy, and productive New Year to you and your family! -Try out raising 50 or so meat chickens. I don't love birds actually (understatement), but I love meat so we're going to give it a whirl. If we are only have as successful with meat chickens as we were with layers this year the venture will be a huge success. -Get new layers in the spring. I'd like to say we will build a bigger, more 4-season friendly than what we have now, but.... I don't want to overshoot. -Build some outdoor hutches for my rabbits so that they can have free access to being on the ground & spend time just being bunnies doing what bunnies love to do (dig holes mostly, wink wink). I'll stop there because I feel a nap coming on just thinking about it.... one good thing about crappy winter weather (occasional naptimes). Best to you & Dan & all the 5Acres crew in the coming year. I'm so glad to have made a new online friend in you, See you soon Leigh! My goals are modest for this year...the main one being to enjoy, daily, the blessings and gifts God gives me...and to be aware, very aware, of them. Merry Christmas and Happy New Year to you and yours, Leigh. my goals are really short term for the moment... Finish the costumes for Beauty & the Beast. Find out IF I'm doing James & the Giant Peach. Kiddo is auditioning for Evita...fingers crossed for that. She is also auditioning for a recording that could turn into a show. We are still waiting to hear if she's been accepted to college (close enough to stay at home). IF I get a break costume wise, I'll need to clean and organize my sewing room, because my current system is not working... I had to move my ironing board to the hall because the room is full of piles of fabric. Happy New Year! I could fill a sheet of notebook paper with projects I really really want done, but my Dan says he is tired of building and wants to maintain. 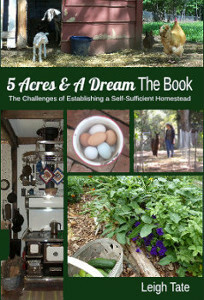 We started in 1989 and having a self supporting homestead was not even thought about. We wanted a log cabin in the woods. If only I could back up! :) We do plan to get our small front porch screened in this spring. I'll just have make the best of what's here. At least we have a fenced-in garden spot and a tiny greenhouse. Will you put in a farm style fence or a living property line, or living fence, or something like that? I don't remember the exact name for it but it's where you use the plants that are there to make the fence like brambles and stuff. It's in one of the BBCs farm through the year historical videos on youtube with Ruth and a couple other guys. It's fun to have plans on how to improve your home. I hope to plant a lot this spring. I may even plant some raspberries in the back corner of our back yard where it backs up to our neighbors back corner where they have planted apple trees. *smile* I also think, due to all the goats heads we have here and the dry land I hope to have a hay bale or straw bale garden near the chicken run. *smile* We shall see. *smile* I would also like to see if my beloved husband could get a cloths line in for me. I was amazed to read that in several housing developments cloths lines are not allowed. Nothing was said about it here though, so ... woo hoo! *big smile* Have a great day. Sincerely, Mommy of two growing blessings & so much more! Barb, health and healing top all, so you've got your priorities right. ;) Our Muscovies are so quite it's hard to think about ducks being noisy! I'm really happy to be making the shift to seasonal, and I really hope we can get the big stuff out of the way this year. Sandra, sounds very right on. Wishing the same happiness to you! The goal of organizing never goes away! LOL My pantry is my worst culprit these days. The problem with living fences is that goats eat them. :) We bought woven wire goat fence for the back of the property, and this is what we will use to replace fence as it needs it too. The welded wire hasn't really worked well because goats lean into it to scratch their sides, and it's easy for pigs to push. Yeah, the trouble with housing developments is home owners associations, who make up the rules. I do understand the desire for neatness and keeping things in good repair, but they do tend to be run according to the whims of those in charge, who often frown on homesteady ideas. I love your goals and don't think folks can plant enough! Looking forward to keeping up with your progress this upcoming year. Great goals! You'll have your hands full. I think you and Dan rubbed off on Bulldog Man and I. We've found a home with land, and maybe putting in an offer. If they accept, we will have all kinds of work to complete with hopes of putting in a spring garden. We also have several small trips planned with the RV. Smart to keep a diminished list for such big goals. They will be incredibly time consuming and resource intensive. I wish you well. Sandy, that's exciting news! I so hope it works out. Looking forward to learning all about it. I thought a small list was a good idea too. Some things are just logical and don't necessarily need a goal. Yesterday we got out the calendar and wrote in some seasonal jobs that needed to be done. Maybe next year I'll switch to that rather than project goals. I am trying to buy the goat book. Haven't found it yet. Astrid, which book is that?